Dominating one of the most famous waterfront skylines, Liverpool's Royal Liver Building is now the centre of the city's business district. Fire detection technology from Notifier by Honeywell is protecting staff and visitors at one of the world's largest international banking institutions, which is located there. Overlooking the River Mersey, when Liverpool's Royal Liver Building was finally completed in 1911 it was dubbed the UK's first skyscraper. It remained the tallest inhabited building in Europe until 1934 and the tallest in the UK until 1961. An enduring symbol of Liverpool's history as a great seaport, the building has an unusual architectural style that combines Byzantine and Baroque elements, along with other distinct styles. Now a place of business for local, regional and international companies with high expectations of accommodation and management levels, it is currently home to one of the largest banking and financial services organisations in the world. 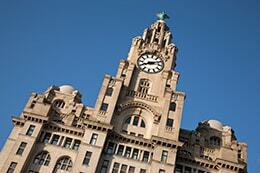 When the company moved into the Royal Liver Building, it sought to redesign one of the floors and install a set of high specification building services, including a new life safety system. Having worked together for many years AMD Environmental, the M&E contractor, called on the services of Kent based Triple Star Fire & Security to provide its expertise. With Grade 1 listed status, everything possible is put in place to protect the building. After carrying out an extensive survey of the bank's premises and taking into account the needs of the occupants, Daren and his team specified a fire detection solution based around Notifier's innovative Pearl intelligent addressable control panel. In addition to the Pearl control panel, over 60 Notifier optical detectors were installed across the occupied area. Sounder beacons are also used at the Royal Liver Building to complement the audible warning with a supplementary visual alert. The Notifier system has also been fully integrated to the Royal Liver Building's house fire detection system, it forms part of the whole building's broader C&E matrix, ensuring a strictly-controlled response throughout the site in the event of any alarm, wherever it arises.